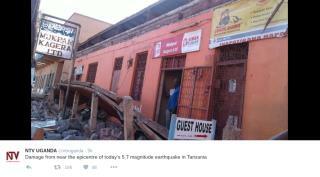 (Newser) – Eleven people have been confirmed killed in a 5.7-magnitude earthquake that struck Tanzania Saturday afternoon, but the actual death toll is feared to be much higher, the BBC reports. According to UPI, the earthquake—which the US Geological Survey says was "unusually strong" for the area—struck shortly before 3:30pm local time near Lake Victoria on the border with Rwanda and Uganda. The shallow quake originated only 6 miles below the surface, the AP reports. Shallow quakes typically cause more damage. Only 11 people dying in that hole should be a good story> Gangsters kill more people than that on a Satruday nite.